Join John Saunders of NYC CNC and mHUB for the Manufacturing Entrepreneurship Summit for an afternoon of inspiring workshops, tours, networking, and celebration. Specifics to be announced closer to the event – register now for this free event to guarantee your spot and get on the e-mail list. Join John Saunders of NYC CNC and mHUB for the Manufacturing Entrepreneurship Summit, an afternoon of inspiring workshops, tours, networking, and celebration. Specifics to be announced closer to the event – register now for this free event to guarantee your spot and get on the e-mail list. John Saunders owns and operates Saunders Machine Works, a machine shop and manufacturer of machine shop tools and fixture plates. John also runs NYC CNC, the most popular YouTube channel on CNC machining and Fusion 360. 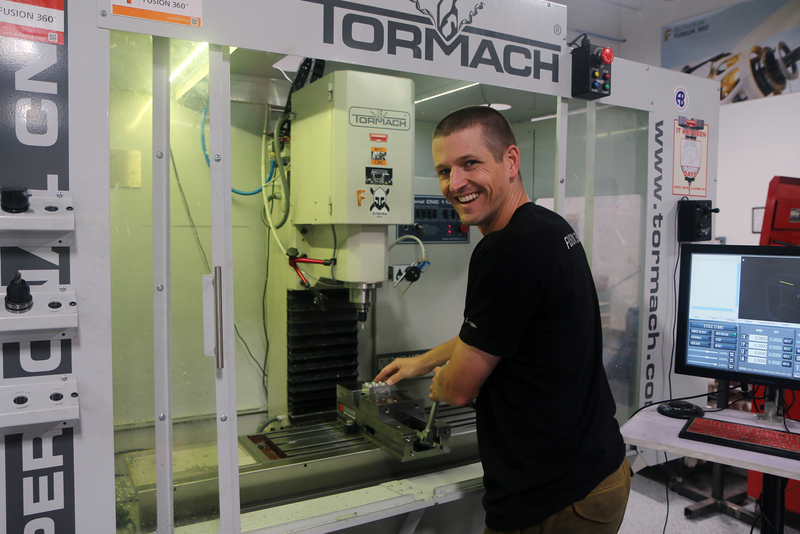 A self-taught machinist, John has used his passion for making in his multiple entrepreneurial pursuits. His latest focus is on educating and inspiring the next generation of machinists, machine shop owners and manufacturing entrepreneurs. John has spoken at numerous industry events, has been recognized as a change agent in US manufacturing, and is proud to sit on numerous manufacturing advisory boards. When he isn’t modeling in Fusion 360 or at a CNC machine, he enjoys Arduino, tennis and his vizsla Judd. And dreaming about Factories that he hasn’t toured – yet. After 12 years on the east coast, John, his wife and two children are proud to call Zanesville, Ohio home. mHUB is creating the conditions for product innovation to thrive. We’re an innovation hub for physical product development and manufacturing with a diverse membership of over 300 entrepreneurs focused on developing breakthrough products in IoT connected device, consumer products, medical device and more. mHUB’s mission is to galvanize the manufacturing ecosystem of industry leaders and entrepreneurs to drive collaborative product innovation. By providing our members with access to labs and equipment, industry experts and workshops, and a community of other product innovators, we’re helping turn ideas into prototypes, and prototypes into sustainable new businesses that will ensure the region’s continued leadership in global manufacturing.